The packaging machine industry has developed into one of Taiwan's export contributors over the past decades after local companies began production using skills and know-how absorbed from abroad to reduce the industry's dependence on imports, and many insiders have built reputations in the global market by taking advantage of division of labor and R&D to achieve flexible, efficient production and supply high-utility machines with stable quality. According to Taiwan Association of Machinery Industry, the sector now consists of about 200 manufacturers presently, mostly clustered in Taiwan's northern and central region and small and medium in size. Most machines that the insiders supply are small and medium-sized models for universal packaging, and are especially sought-after by professional buyers from Asian nations as Singapore, Malaysia, S. Korea, Japan, Indonesia, etc. However, the underselling competition by emerging rivals globally is still the main threat to the sector, resulting in an increasingly harsh landscape to Taiwanese suppliers, especially those who can't further upgrade products because of resources limitations. But, some of them remain undaunted, and have managed to engage themselves in developing higher-end models, exploring new markets and other ways, in efforts to maintain their competitive advantages and sustainable development. The following introduces a couple of such dynamic, formidable Taiwanese suppliers in the line. High-Speed OPP Labeling Machine by Gold Great GoodA technologically leading supplier of labeling machines in Taiwan, Gold Great Good Machinery Co., Ltd., founded in 1986 in Taoyuan County, northern Taiwan, has launched several cutting-edge models that can even match those made in Germany and Italy in performance and speed. 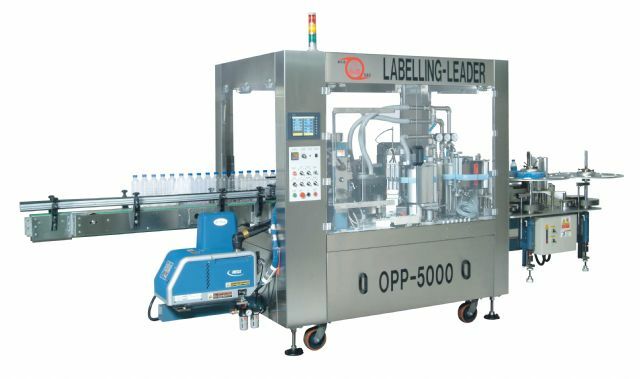 Among those machines, the automatic high-speed OPP labeling machine series provides a striking example of the company's strong R&D capability. 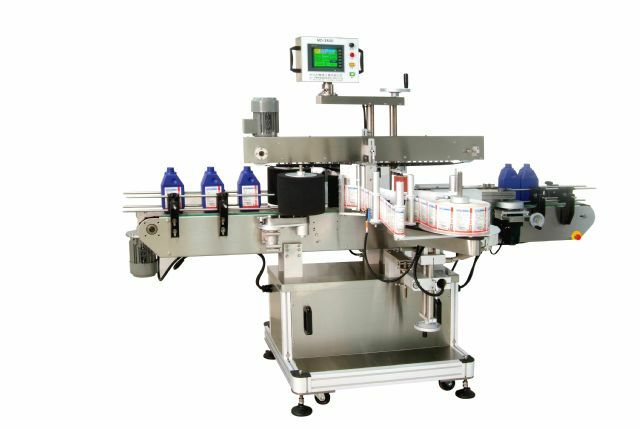 Coded MD-6000-OPP, the latest model of the family is highlighted with a star-shaped wheel that firmly carries containers while dispensing to provide stable dispensing performance under high-speed operation, and a servo motor that synchronously track label supply and cutting, and a specially designed vacuum drum to enhance labeling precision. The MD OPP automatic high speed OPP labeling machine series are Great Gold Good’s pride. Further, the machine adopts the so-called three-phase PLC and AV variable control with a synchronized tracking and control system to maintain label cutting accuracy in different running speed. For better stability, a welded, sturdy body enables the machine to turn out up to 600 bottles 3,000c.c. in capacity per minute without dysfunctions occurring. Easy operation and maintenance, as well as enhanced safety, are also the machine's appeals. The equipment is designed with a centralized lubrication system and a sensor that detects material feeding so as the machine can automatically adjust speed according to feeding situations, and a system safety device that can immediately turn off the machine when irregular torques, abnormal feeding and other malfunctions occur. A number of the best-known enterprises, such as Coca Cola, Pepsi, P&G, Unilever, Quaker, Uni-President, Taiwan's largest food and beverage supplier with the biggest convenient store chain, and Kinmen Kaoliang Liquor, a state-owned liquor brewing company in Taiwan, are on Gold Great Good's customer list, while nearly 99% of all bottled mineral water sold on the island is labeled by the company's machines. Committed to continuous improvements of quality and functionality, L.H. Tsai, general manager, indicates that the company has just worked out an upgraded model of MD-6000-OPP, named MD-9000-OPP, which can turn out 900-1,000 bottles per minute with higher stability and more consistent quality to lead the industry. “Gold Great Good is versed at electromechanical integration, and this competitive advantage enables us to develop top-tier labeling machines and compete well in the big league where top-end German and Italy suppliers exist,” says proudly Tsai. Taiwan's No.1 Labeling Machine SupplierFollowing nearly three decades of hard work, the company, which Tsai emphasizes worked out Taiwan's first homegrown automatic self-adhesive labeling machine, has developed into the island's largest supplier who commands now over a 95% share of the Taiwanese market. Presently, this manufacturer supplies varieties of products, including servo-labeling machines, front and back labeling machines, eco-friendly labeling (OPP roll-reed labeling) machines, labeling machines for thermal-film bottle packaging, auto shrinkable label inserting machines, multifunctional two-sided labeling machines, and round bottle labeling machines, and markets globally with it's “Aplus” brand. Tsai points out that to achieve exceptional quality and boost competitiveness, the company's R&D department is dedicated to researching and developing new labeling technology, and spends considerably on innovation. The company's new optional function of 24-hour operation applied in its automatic labeling machine is a product of such efforts, which proves effective to significantly enhance production efficiency of over 98%. For now, this firm is also one of only a few Taiwanese companies capably supplying automatic label changers. BenisonEstablished in 1962 in Taoyuan County, northern Taiwan, Benison & Co., Ltd. is a veteran supplier of shrinkable packaging materials and machinery, and leads the sector by its superior technologies. The company produced spray hoses, shrinking tubes and wiggery in the very beginning, and then began venturing into shrinkable packaging materials and machines in 1975. Following decades of development in the field, today the company employs more than 200 workers in plants in Taiwan, and some 100 ones in the Philippines, China and Thailand, as one of the largest suppliers in the line. Its available product category covers a broad range of packaging materials, such as polyolefin, OPP, PE, PVC, heat shrinkable labels and cap seals and insulating tubes, and packaging machines, like sealing machines, applicating machines and customized packaging lines. Worth mentioning is that Benison was the winner of the 5th Rising Star Award founded by Taiwan's Ministry of Economic Affairs (MOEA) to highlight top-notch small and medium-sized enterprises which are competitive in export and innovation. To better compete against emerging rivals, Liao mentioned, Benison promotes different products in different markets to ensure the highest possible profitability. For example, the company targets its high-quality packaging machines in Japan and label materials in Europe. Besides, the supplier operates production factories in China and Southeast Asia in order to supply locally. The USA-005P (CE) Auto Side Sealer features use of servo motors and maximum packaging speed of 400bpm. Annual Technology Exchange ConferenceHowever, what builds up Benison's current success is its well-honed technology, which is regularly unveiled and physically demonstrated at the technology exchange conferences held by itself annually at home, according to Liao. Through such events, Benison has effectively impressed buyers and visitors with its cutting-edge machines and technology that meet market trends. For instance, since side sealers are gaining popularity among professionals for higher material efficiency, more stable sealing, extendible packaging length, higher speed and better quality, Bension's USA-005P Auto Side Sealer for shrinking wrapping is built with 2 750W servo motors and 2 25W induction motors, and features an improved graphic operator interface with 40 sets of memory modules and multilingual options, a CE-approved control system with easy expandability, a adjustable speed motor-incorporated feeding device compatible with printing sensors, a conveyor device whose belts are made of imported PU from Japan to meet food safety regulations, and a side sealing device, in which temperature of cutters, all Teflon-coated for easy cleaning and maintenance, is consistently maintained by a SSR (solid state relay) controller and timing belts are used for sealing stability. The machine can seal objectives with height from 2mm to 140mm, with packaging speed of up to 40 packs per minute. Tru-BriteFully understanding that regular release of new machine models can not just attest to its cutting edges but also effectively lure international buyers' eyes to facilitate promotion, Tru-Brite Machinery Co., Ltd., a rewinding machine manufacturer beginning in 1998 in New Taipei City, northern Taiwan, is committed to R&D as its savvy strategy in the competitive market. 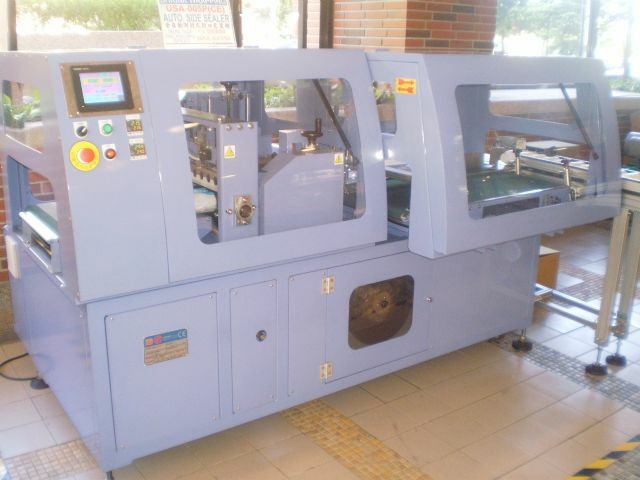 The company supplies wide-ranging lineup of rewinding machines, including automatic cling film rewinders, automatic aluminum foil rewinders, semi-automatic cling film slitting rewinders, semi-automatic aluminum foil and cling film rewinders, etc. This supplier exports 95% of its machines all around the world every year, mostly to the Middle East, Southeast Asia and Africa. The president Y.C. Wu indicated that his company spares no efforts on R&D, continuously designing and improving machine models to meet market trends toward rewinding machines with high performance, high efficiency and great functionality but without need for considerable manpower. It is such a product strategy sustaining the company's growth. The Six-shaft Automatic Aluminum Foil and Cling Film Rewinder coupled with Automatic Rewinding & Shrinking Film Packaging Machine as an integrated packaging line is the embodiment of the company's strong R&D capability. Wu pointed out that at the front of the packaging line, which is also incorporated with Nordosn's hot melt module and an improved labeling system and a hot-air system, is the automatic rewinding machine model AH-6S, while the automatic packaging machine is for back-end production. The finished rolls are carried on from a re-reeling machine by a roller conveyor to the wrapping station, with shrinkable films for wrapping available in materials of BOPP, OPP and PE. Thanks to the static charge of films and the curling tendency in accordance with the surface of products to be packed, the machine assures excellent adherence between films and packaged products. Furthermore, Wu emphasized, this series is Taiwan's first homegrown model of this kind, and needs the least manpower to operate. This line is the embodiment of the company's strong R&D capability. 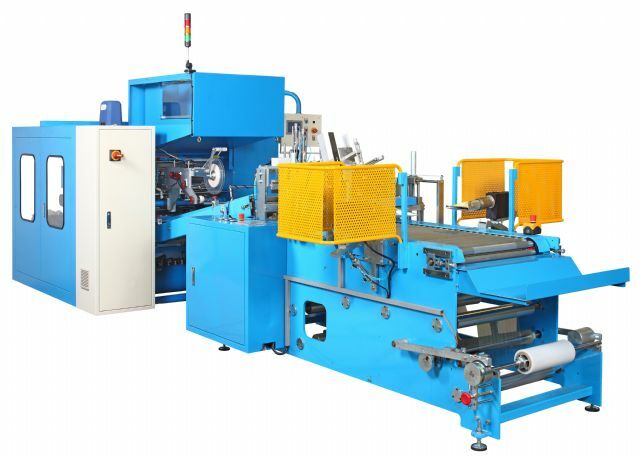 Wu introduced that at the front end of the packaging line, which is also incorporated with Nordosn's hot melt module and an improved labeling system and a hot-air system, is the automatic rewinding machine model AH-6S; at the back end there is the fully automatic packaging machine, coded TPG50. “This packaging line can turn out 20 rolls of 10-meter aluminum foils and PE or PVC films a minute, and glue or tape the rolls without turning off, with the tolerance for foil and film length minimized to only plus and minus 10mm,” said Wu. “This effectively enhances productivity of this line to ensure customers considerable savings and profits.” The owner revealed that his company is trying to further boost the line's functionality by adding an automatic box packaging machine, and will soon start promoting it at professional trade fairs worldwide as its ace in the hole this year.